Activision released a new trailer for Terminal Reality’s The Walking Dead: Survival Instinct today, officially announcing that the game will launch for the PlayStation 3, Xbox 360, Wii U, and PC on March 26th in North America and March 29th across Europe. Sadly, the nineteen-second-long trailer also throws up a big red flag warning The Walking Dead fans that this might not be anything to get excited for. With the Survival Instinct‘s launch date a little over two months away it would be reasonable to assume that Activision would take this opportunity to finally show us some actual gameplay from the survival shooter — especially when you consider that their first and last gameplay trailer was actually just some old unimpressive footage cobbled together by a fan — but that didn’t turn out to be the case. 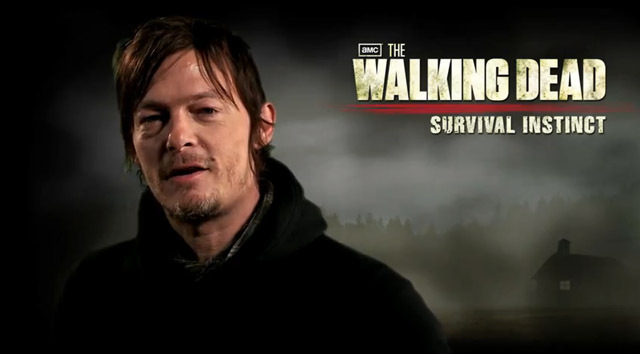 The release date trailer consists of Norman Reedus (the actor who plays Daryl Dixon) telling us to “Check out Activision’s new game, The Walking Dead: Survival Instinct“. This is followed by Michael Rooker (Merle Dixon) asking us, “Merle and Daryl in a game. What can be better than that?”. We are then prompted to immediately stop everything we are doing and run out to GameStop to pre-order The Walking Dead: Survival Instinct — as if there is some great danger that we won’t be able to find a copy on launch day. Now there is always the off chance that Survival Instinct will turn out to be the zombie game of our dreams, but I would not hold my breath for it at this point. When a game is this close to its release date and all that has been officially shown is a handful of not-so-hot screenshots and some old gameplay footage that the developer later distanced themselves from… Let’s just say that it is not a good sign. Terminal Reality did promise that an “official” gameplay trailer for The Walking Dead: Survival Instinct would be coming soon. We will let you know when that happens, in the meantime you can check out the release date trailer below to see two actors fail to even pretend that they are interested in the product they are hawking.